A scandalous video of a woman whose physical features bear a striking resemblance to that of Senator Leila De Lima has resurfaced on Facebook. A certain Miguel posted the 1-minute, 54-second clip at 6:26 p.m. on August 31, 2016. 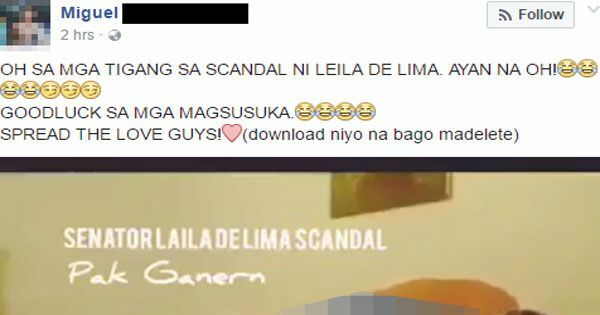 In the caption, the uploader said the video was for people who are "thirsty of De Lima's scandal." He wished good luck to those who will "throw up." "Spread the love guys," posted Miguel, who also encouraged viewers to download the video before it gets deleted. A netizen who tipped us about the video said he noticed that the faces of the man and woman doing a sexual act were blurred out. The tipster traced the adult site where the video was posted and found out that the woman, apparently, is just "a lookalike." Back in June 2014, Whistleblowers Association of the Philippines president Sandra Cam claimed that then justice secretary Leila de Lima has scandal videos. In fact, she challenged the former cabinet official and now Senator to file a libel case against her so she can "have the chance to bring the truth to court." Until now, Cam has reportedly maintained that the clips she obtained over two years ago are still in her possession. Recently, there were rumors that a fake copy of the clip will make rounds on social media to make it appear that the alleged De Lima scandal video was digitally altered. Such reports were not verified.